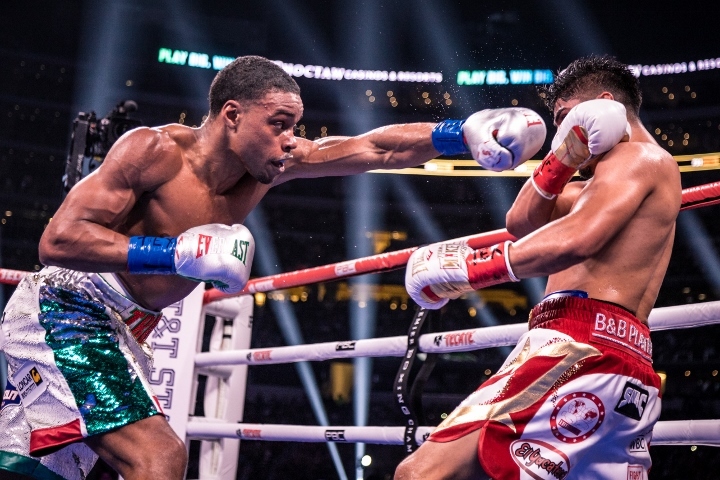 ARLINGTON, Texas – Had Mikey Garcia gone about the buildup of his fight against Errol Spence Jr. in a different fashion, Spence suspects the four-division champion might’ve had a chance. Garcia was “so arrogant,” according to Spence, it made the unbeaten IBF welterweight champion prepare just as hard for their fight as usual. Some fans and media perceived the significantly smaller Garcia a longshot, but Spence respected Garcia’s boxing ability and courage and trained accordingly. The ambitious Garcia’s greatest mistake, Spence says, was repeatedly stating that he was better than Spence in ever facet of boxing. Having such legends as “Sugar” Ray Leonard and Mike Tyson pick Garcia didn’t help the lightweight champion’s cause, either. A motivated, vicious Spence picked apart Garcia for 12 rounds Saturday night at the Dallas Cowboys’ AT&T Stadium. The 29-year-old Spence (25-0, 21 KOs) was so dominant, none of the three judges scored a single round for Garcia (39-1, 30 KOs). Connecticut’s Glenn Feldman (120-107), Florida’s Alex Levin (120-108) and Puerto Rico’s Nelson Vazquez (120-108) each scored their FOX Sports Pay-Per-View main event a shutout for Spence, of nearby DeSoto, Texas. A reporter asked Spence during their post-fight press conference if Garcia’s “arrogance” concerned him at all, in the sense that maybe Garcia knew something Spence did not realize. “It didn’t concern me at all,” Spence said. “It actually put a chip on my shoulder. If he wasn’t so arrogant, he probably, might’ve caught me off guard a little bit. But, you know, with his arrogance and, you know, his whole, his brother and, you know, his brothers and everybody else – I watch everything on YouTube with my opponents. [QUOTE=j.razor;19602270]Bradley talked about regretting not fighting Floyd too....[/QUOTE] Desert Storm was #3 147lber but fought nobody...now all of sudden everyone ducking TC?